This updated edition of Eat Move Sleep includes a new mobile app that not only tracks how you eat, move, and sleep—it allows you to connect with friends across various platforms (eg. Android, iOS) and mobile devices (eg. Fitbit, Jawbone, Garmin, myfitnesspal). Unique and user-friendly, Welbe allows you to keep all your diet, fitness, and sleep-related info in one central place and share it with your friends. The latest New York Times bestseller from Tom Rath, featuring a host of online tools for individuals, groups, and organizations. 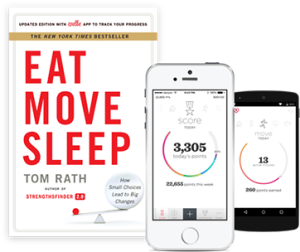 While Tom’s bestsellers on strengths and well-being have inspired more than 6 million people in the last decade, Eat Move Sleep reveals his greatest passion and expertise. After quietly managing a serious illness for more than 20 years, Tom has assembled a wide range of information on the impact of eating, moving, and sleeping. Written in his classic conversational style, Eat Move Sleep features the most proven and practical ideas from his research. This remarkably quick read offers advice that is comprehensive yet simple and often counterintuitive but always credible. Eat Move Sleep will help you make good decisions automatic–in all three of these interconnected areas. With every bite you take, you will make better choices. You will move a lot more than you do today. And you will sleep better than you have in years. More than a book, Eat Move Sleep is a new way to live. For more insight, please visit the Eat Move Sleep website. For your overall approach to eating, find foods with less fat, fewer carbohydrates, and as little added sugar as possible. is a real time intelligence that tracks the wellbeing tools you already use into one place.